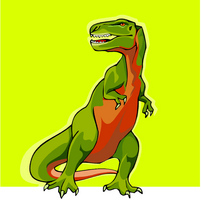 1 Tyrannosaurus rex was a fearsome dinosaur. It weighed between six and ten tons. It had huge jawbones. Its mouth opening was three feet across! T. rex was a theropod dinosaur. Theropods were two-legged meat eaters. T. rex was one of the last, and biggest, of the theropods. 2 The early theropod dinosaurs like Herrerasaurus (Heh-RARE-ah-SAW-rus) had longer arms with as many as five fingers. However, T. rex had very small, short arms. It had only two fingers on each hand. Its short arms couldn't even reach its mouth. With only two claws, it couldn't grip its prey. Why did the theropods evolve with shorter arms and fewer claws?